YURI was born with a sack-like lump on her lower back. 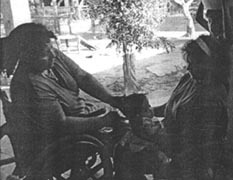 Her mother, Eva, sold the family donkey and took Yuri to a city hospital. She was told that her daughter had spina bifida, a deformity of the spinal cord that often causes paralysis of the lower body. Surgery was done to cover the delicate sack of nerves with healthy skin. During her first months of life, Yuri grew well and seemed healthy. However, her mother was concerned that her body was bending more and more to one side. When she was 4 months old, her mother took her to PROJIMO. The team encouraged Eva to take Yuri to the city for X-rays and evaluation. But that would cost too much for the family. Eva asked if something could be done in the village at a lower cost to help correct the spinal curve, or at least to keep it from getting worse. This led to a discussion about different possibilities. First the team suggested some sort of a body jacket to hold the baby's body straighter. But it was summer and the weather was extremely hot. Yuri's mother was worried that the baby would cook to death in a confining plastic jacket. She already suffered from heat rashes. The next idea was a kind of molded mattress. The baby was still quite small and spent a lot of time lying on her back. Juán, one of PROJIMO's brace-makers, thought he could make a mattress out of foam-plastic. 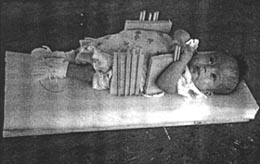 He would mold or carve out the foam to hold the baby in an improved position. However, both the body jacket and the molded mattress would have a serious limitation. The position would be fixed, and not easily adjustable. 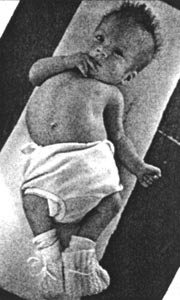 Some sort of an adjustable positioning device was needed that could be modified as the baby's body gradually straightened. One suggestion was to use 3 adjustable padded posts, positioned so as to help straighten the baby's body. Out of the suggestion of 3 padded posts, a better idea grew: to use 3 rows of thin wood rods (dowels). 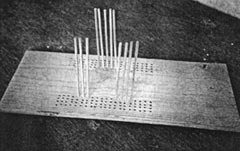 The rods fit snugly into holes in a wooden bed-board. By drilling rows of closely-placed holes, the posts can be positioned so as to press against the baby's body and to match her contours - almost like hands. The position of the rods can be adjusted and readjusted easily to meet the child's changing needs. The team and Yuri's mother, Eva, decided the idea was worth trying. This back-bracing bed was made in about 2 hours, and then tried with the baby. 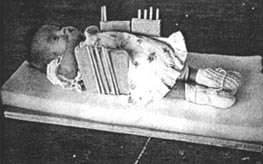 The position of the wooden rods could be easily adjusted, even with the baby lying between them. To everyone's wonder, not only did the crib hold Yuri in a much improved position, but did it so gently that the baby appeared to be comfortable. 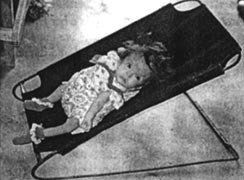 The team advised Eva to at first leave her baby in the device for only 15 or 20 minutes, and then - as long as the baby seemed comfortable - to gradually lengthen the time, until the baby could spend 2 to 3 hours in it at a time. The importance of often removing the baby for play, movement, feeding, and affectionate handling was emphasized. Yuri's mother smiled warmly in response to this advice. Hydrocephalus (water on the brain) often occurs with spina bifida and, unless corrected early with a "shunt," can cause brain damage, and sometimes blindness. To a limited extent, the back-brace crib served its purpose. Yuri's mother, Eva, used it for her baby several hours each day. Three months later, the curve in the baby's back had not increased, and it appeared to have decreased somewhat. However, it was clear that Yuri's overall development was quite slow. 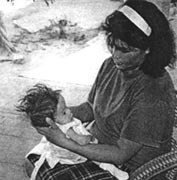 As often happens with spina bifida, she had been born with hydrocephalus. With this condition, liquid builds up in the brain and the head becomes larger than normal. Brain damage can result. To prevent brain damage, the doctors in the hospital had put a drainage tube, or shunt, into Yuri's brain. Nevertheless, brain damage was apparent. Partly because of her large head, she did not begin to lift her head, to roll over, or to sit, at the age when most children do. Except for a little motion of her arms, she almost did not move at all. Body movement is important for the overall development of a young child, especially for the growth of balance and body awareness in a baby who is mentally and physically delayed. The PROJIMO team, together with a visiting physiotherapist, Ann Hallum, encouraged Eva to handle the baby often, to encourage a variety of movements, and to help her to develop the neck strength needed to control her large head. 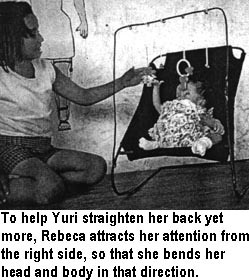 Mari teaches Yuri's mother, Eva, to help her baby gain head control by gently supporting Yuri's head with her fingertips when her head begins to fall. Eva helps Yuri develop head control by catching her head with her fingertips when it starts to fall. In this first trial model of the bounce-bed, the cloth was stretched fairly tightly over the metal-bar frame. This permitted Yuri's body to twist a lot to one side. A BED WITH A BOUNCE. To encourage increased body movement, PROJIMO's special-equipment maker, Juán, made a small rocking bed for Yuri. 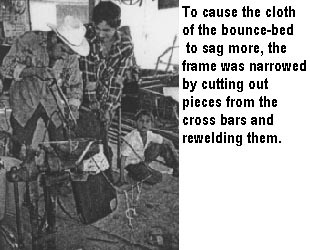 He bent a piece of 1/4-inch re-bar (reinforcing rod) to form a sloping metal frame, supported at the lower end. Over this, he fitted a canvas sling. On the sling, he attached a soft cloth sewn in the shape of diapers, to hold the baby. The advantage of this bed is that, with the baby's slightest movement, the whole bed rocks up and down. 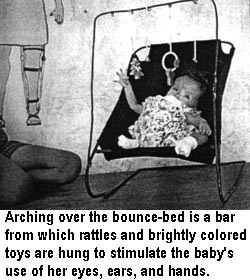 This change in the baby's angle, and her position in relation to her surroundings, stimulates the child to move. Encouraging motion in response to movement helps the baby gain greater body awareness. Loosening the bed-cloth to help correct the spinal curve. On trying out the new bounce-bed, it seemed to work well. At the baby's slightest movement it dipped up and down, and the baby seemed to enjoy this. But, while observing Yuri on the spring bed, Mari and the baby's mother, Eva, were concerned about the sideways curve in the baby's back. The curve was still quite marked, and the bed did little to correct it. Mari had an idea. If the canvas were allowed to sag more from side to side so that the baby would lie in a cloth trough, this might hold her in a straighter position. So the shop workers made the cloth sag more. When Yuri was placed in the modified bed, its trough-like form did, indeed, hold her body in a straighter position. The modified bounce-bed thus serves a double purpose. The gentle pressure of the cloth trough helps to correct the sideways curve of the child's spine, yet allows freedom of movement. The bed dips up and down in response to the child's slightest movement. The hanging rattles and toys above her head catch her attention. She reaches out to play with them. This causes still more movement of the bed, which, in turn, provides visual and bodily stimulation that may help to speed the child's development. In conclusion, Yuri's development will probably continue to be slow because of the brain damage caused by hydrocephalus. But, with the help of a wide range of stimulation, including the bounce-bed, she is making progress.